When Forever 21 opened their first store outside of California, they went straight to Mall of the Americas in Miami, Florida in 1995. This small store was a GREAT find for me back then since the items were of good quality, fashionable styles, and extremely affordable prices. clothes which I reluctantly shared. As a result, stores began to pop up all over the place! Sigh, my secret was out. I do tend to have a love/hate relationship with the brand though. I could go there at certain times and all their stock is too trendy or not age appropriate for someone over the age of 25. But I got very lucky this summer since their items helped me update my boring closet! My local Forever 21 (now located at Sawgrass Mills Mall) was chock full of summer dresses, shoes and accessories that I could not only fit into but also look good in! As a curvy chica, I can't wear just anything. I have a big bust, short waist, and big hips, so shopping is not as easy as it is for my thinner sista's out there. But I lucked out this year and grabbed the two dresses featured up top for under $20 a piece! It came at the perfect time too since I had just finished going through a frumpy phase where I would throw on baggy items to hide my curves. 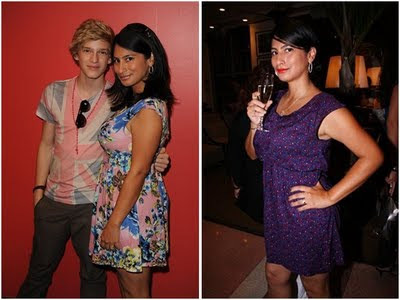 The dress on the left I wore to a special event where Cody Simpson (posing with me!) performed at Y-100 and the dress I wore on the right I wore this past Sunday to an event honoring photographer Robert Zuckerman in Miami Beach. When I bought the first dress (left), I also nabbed a pair of heels that ended up matching perfectly with the second ensemble. Side Note: The nail color on my toes is Revlon's Siren which i got on sale. Detail's here. I originally went to Forever 21 because I wanted to try on some rompers since it seems to have been the "IT" item of the summer. But sadly I couldn't find one that worked with my body type. I love the shoes mama. I also live in Miami but I don't do well in the heat and recently started getting out more. Now I need to learn to dress better for the hot weekends here. maybe your blog can help me find cumfy and light weekend clothes for this curvy body. I have a Demi Lavato shape (please put up more pics of her) and I'm 5'3". So hard to find clothes that fit right.